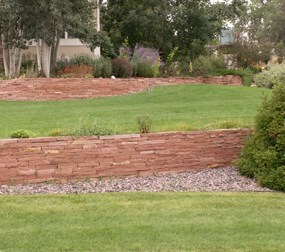 Un-cut wall rock is the perfect natural stone for use as retaining wall blocks for your landscaping projects. 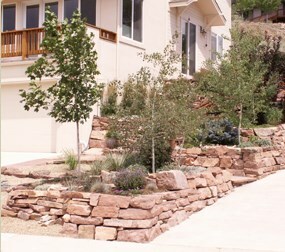 These beautiful uncut landscaping rocks are sourced from our quarry in the Colorado Rockies, making them perfect for blending into your Colorado landscape. Contact Loukonen Bros. Stone for the best natural stone available to Denver, Boulder, Longmont, and the rest of the Colorado Front Range and foothills. Size: Types – Quarry Drywall, Moss Drywall, Random sizes that range from .5 to 4 sqft., No cut edges, for the Natural Look! Coverage: Covers: 1-foot height by 15 feet long per ton. 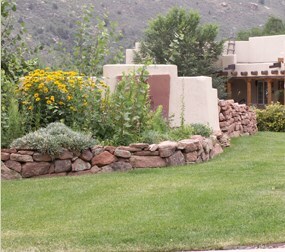 Uses: Walls along paths, Terraced Walls, Retaining Walls, lining Ponds, and waterways. BUFF-Most materials are a Gray base color and range from Light Gray to Tans to Brown/Bronzes. Size: Types – Cutface and 8″ Drywalls Random sizes that range from .5 to 4 sqft., one cut edge on a surface, 3 cut edges on 8″ for the Finished Look! Thickness: Thickness Range: 1 1/2′ to 8″, Special order up to 12″ thick). Coverage: Covers 1-foot height by 15 feet long per ton.